The shattered rear window of Lorraine Cooper's car. PHOTO: Rekord Centurion. The Centurion woman says the bullet shattered her rear window during a shootout between police and alleged car thieves, missing her head by millimetres. Lorraine Cooper was caught in the middle of a shootout between police and car theft suspects in Irene, Centurion, in Gauteng on Wednesday afternoon, according to Gauteng police spokesperson Lieutenant Colonel Lungelo Dlamini. Cooper heard shots while travelling in heavy traffic near the corner of Nellmapius and Jan Smuts drives on Wednesday afternoon. “I got such a fright. The next moment my car window shattered,” said Cooper. “I saw a white Volkswagen Polo and a blue Ford Ranger speed past me while occupants shot at each other,” she said. While she was afraid to move her bakkie in case she got caught in the middle of the shootout, Cooper eventually managed to pull over and assess the damage. She said it was only then she noticed the bullet had clipped her headrest after it shattered the rear window on its way through the car, missing her head by millimetres. 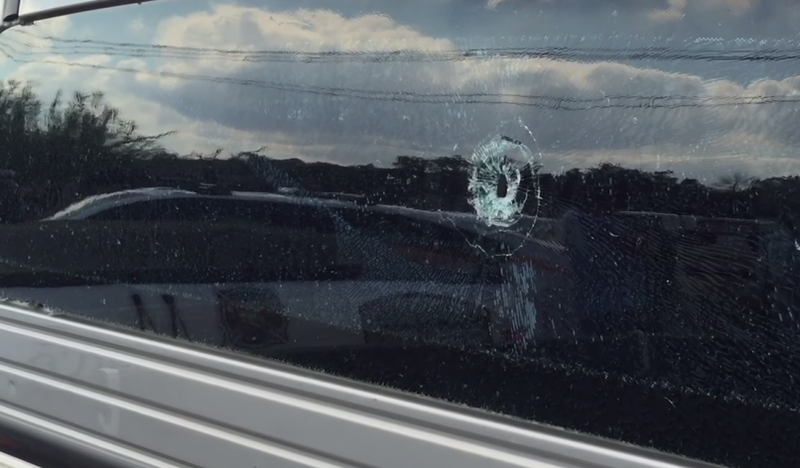 The bullet exited through the car’s windshield. Orange Fox Security and their medical intervention unit went to the scene after they were told a woman had been shot. When they arrived they found Cooper unharmed. “I am so thankful to be alive,” she said. “The bullet just missed my head. I might still cry. I am still in shock,” she said. “There were no arrests but police recovered a car stolen in Sandton,” Dlamini said.